Heating aioli is possible, but not necessarily recommended because of the way the sauce is traditionally made. Aioli is one of the classic "grand sauces" of French cooking; it's a thick, pungent sauce composed of garlic, eggs and oil. Although described as a mayonnaise by some experts, aioli differs from mayonnaise in that it uses lots of garlic and olive oil, while mayonnaise uses more vegetable oils and eggs only. Hailing from France's Provence region, traditional aioli is made by grinding garlic cloves with salt and olive oil using a mortar and pestle. 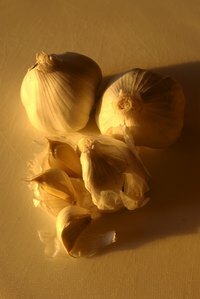 The garlic acts as an emulsifier to thicken the sauce. Today's standard versions of aioli also include Dijon mustard and egg yolks. Whether it's made with traditional or contemporary ingredients, expert chefs say there are two key elements to making aioli: temperature and time. All the ingredients must be at room temperature before combining. The cook then grinds them together patiently, adding the oil slowly until the sauce thickens. If too much oil is added too quickly, the sauce won't emulsify properly. Contemporary cooks have looked for shortcuts to the laborious process of making aioli, which may be the motivation behind one recipe that calls for heating the sauce to thicken it. This alternative recommends combining the ingredients in a food processor, then slowly heating the mixture, whisking constantly, until it thickens. When making aioli using this method, it's recommended that you use heat-tolerant oil such as safflower in place of olive oil. Once again, be careful not to heat the sauce too fast, as heat will make it separate. If the sauce separates, try whisking one egg yolk in a bowl, then add the separated sauce and whisk the sauce until it emulsifies again. Often aioli is served with cut raw vegetables known as crudité. In these globe-trotting times, aioli can be found accompanying various foods, from cold meats in Spain to french fries in Australia. In Provence, aioli is spread on baguettes that are made into croutons and served with the region's popular fish soup. Variations on classic aioli include adding minced fresh rosemary or chipotle peppers. Another version includes a pinch of saffron with a tablespoon of honey. Once caution with aioli: its use of raw eggs makes it hazardous for some people. As with any sauce or dressing made with raw eggs, aioli probably shouldn't be eaten by children, the elderly or pregnant women to avoid the possibility of food-borne illnesses that might harm the fetus. This danger can be compounded because aioli, even when heated to thicken it, is usually served at room temperature. That's within the "danger zone" between 40 and 145 degrees Fahrenheit where bacteria can grow in food.